Build a portfolio this summer with the Art classes at Skillz! Twice a week, on Tuesdays and Thursdays from 10:00 AM to 11:30 AM children will learn or perfect art skills and develop their artistic talents. Students will strengthen their knowledge of art and expand their self confidence as artists. Each creative art project offers the opportunity to discover new media, concepts and styles. Classes are kept small assuring a one to one guidance tailored to each student's needs. Several projects will be completed resulting in a smalll portfolio of art work. There are two groups: 8 - 12 years old and 13 - 16 years old. Coming from a multicultural Slavic ethnicity, Oksana Oubari was bathed in different forms of arts since her early years. She completed her studies at the Donetsk School of Arts then traveled to Russia to refine her skills attending a multitude of classes in divers plastic arts disciplines before landing 13 years ago in the Lebanon where she actually lives with her husband and kids. A dedicated mother, she continued working and improving her skills while raising her 2 boys. Oksana is fluent in English/French/Russian & Ukrainian. Her teaching career started 4 years ago, in both group classes and private lessons for kids and adults aged from 5 to 77. 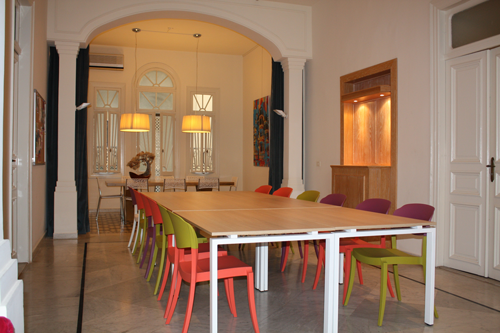 Skillz is a training center in the heart of Gemmayze, located in an old French colonial building with its own courtyard. Skillz gives a variety of training, workshops and courses and hosts events.